Today’s giveaway is for two great items from LEGO Friends. We super-love LEGOs at our house. Brayden is obsessed and the girls have followed suit. Kaitlyn fell in love with both of these items the moment they got here. The sticker book has kept her busy for hours and she has enjoyed making creations with the LEGO brickmaster. These are super cute! Your little girl will love them too! 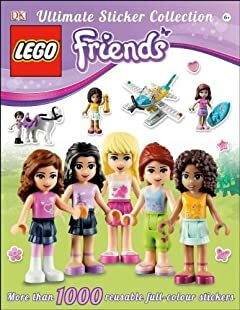 of all the LEGO® Friends mini-doll characters and their accessories, pets, and favorite places! extra help for children to complete their sticker books. When the girls of Heartlake City are around, there’s always something cool to do! Brickmaster will bring creativity and fun together in a way like never before! 2012 The LEGO Group. Produced by DK Publishing under license from the LEGO Group. TWO winners will win one of both of these items! Let’s get entering. Free entry! But you must enter to get it. Entries will be accepted until I choose the winner March 29, 2013. The winner will be announced March 29, 2013. I am a follower. I love your blog and it has been such a help for me. Thanks for all the time and effort you put into sharing and helping other moms out. I like Chronicles of Babywise Mom on Facebook.